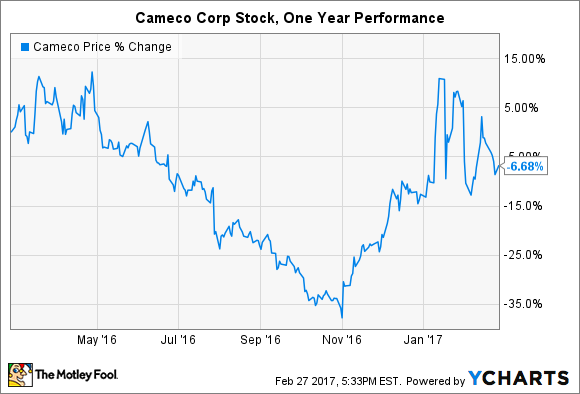 Investors looking for bargains should consider buying stock in Petrobras, Cameco Corp, and Chuy's Holdings. Who doesn't like buying things on sale? Whether cars, groceries, or stocks, there are always bargains to be had if you know where to look. That may be difficult to believe for the latter, especially considering that the stock market continues to set all-time highs, but value investors know that beaten-down stocks exist in every market. Investors looking for opportunities that others may be overlooking should consider Brazilian oil producer Petrobras (NYSE:PBR), world-leading uranium miner Cameco Corp (NYSE:CCJ), and fast-growing restaurant holding company Chuy's Holdings (NASDAQ:CHUY). Here's why these stocks are on sale -- and why you may want to buy them. Brazil may be mired in a recession, but at least it's finally healing after several state-owned companies were caught in an epic money laundering scheme that saw over $9 billion trade hands illegally. It led to the impeachment of an elected president and, unfortunately for citizens, the rollout of overbearing austerity programs by a president that never ran in a public election. Investors were also caught in the fray, as state-owned oil company Petrobras was at the center of the bribery ring. It wears those scars on its balance sheet and in its stock price. Although the investigation remains ongoing and criminal charges are still being handed down, the worst fallout from the scandal is behind the company. 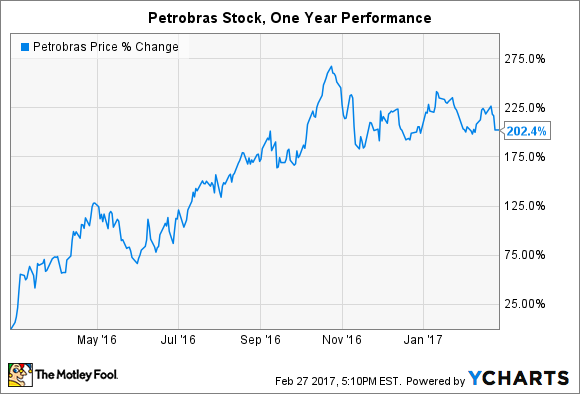 Increasing optimism helped Petrobras stock launch from a 13-year low to rise 137% in 2016. Despite the gains, the stock is still undervalued by both historical terms and forward-looking potential. Management announced an ambitious long-term strategy in 2015, and has been executing so far with great results. Petrobras is paying down an enormous debt load -- it paid $6.3 billion in interest expenses in 2015 and had as much as $162 billion in total debt that year -- through a combination of more efficient operations and sales of non-core assets. That resulted in more than $40 billion in debt reduction by the end of September 2016, although the company wants to achieve plenty more reductions by the end of next year after selling an additional $21 billion in assets. Continued improvements to the balance sheet should be aided by a strong cash position, which stood at $23 billion at the end of September 2016, and strong cash flow from operations, which generated over $21 billion through the first nine months of last year. Petrobras may not be a household name, but those in those categories it led all multinational oil companies (then again, so did its debt balance). The one knock on the company's future may be its pursuit of expensive deepwater assets, which shouldn't be surprising considering the Brazilian offshore Lula field ranks as one of the largest oil discoveries in the last several decades. If it can successfully lower its risks by collaborating with multinational peers -- a successful strategy for developing megafields off the coasts of Australia -- then higher and more stable crude oil prices should provide additional fuel for future stock gains. The world's largest uranium miner can't seem to catch a break. The world's appetite for nuclear energy has cooled off since the Fukushima Daiichi nuclear disaster several years ago, resulting in a lull period before new reactors in emerging economies start operations in the next decade. Uranium supplies are at a historic mismatch with demand, which has made it the absolute worst-performing commodity in recent years. If that weren't enough, just last month Tokyo Electric Power Company, or TEPCO, notified Cameco that it was terminating a supply contract worth $990 million in revenue for the supplier through 2028. The reason? It hasn't been able to operate any of its 17 nuclear reactors in the last 18 months thanks to restrictive Japanese government policies regarding atomic energy. The situation is not ideal and has led to an increase in volatility for the stock, but investors that believe in the long-term potential of nuclear power may see a buying opportunity. Management's ability to cut costs and maintain volumes has helped to make the best of a bad situation, and should continue to benefit investors in 2017 and 2018. Meanwhile, several states that rely heavily on nuclear energy have approved Zero Emission Credits, or ZECs, that provide financial incentives for the owners of nuclear power plants. A small $0.01 per kWh subsidy in Illinois will keep Exelon Corp, America's largest nuclear operator, from closing two power plants, effectively extending the useful lives of each by over 10 years. If more states adopt similar measures to build a bridge to a future powered by carbon-free renewable energy, then it could bolster the investment case for Cameco and help stabilize operations before new reactors come online. A dividend yielding over 2.5% provides additional persuasion for value investors. The investment thesis for the authentic Mexican food restaurant holding company is pretty simple: Buy the stock for consistent and profitable double-digit growth year after year. 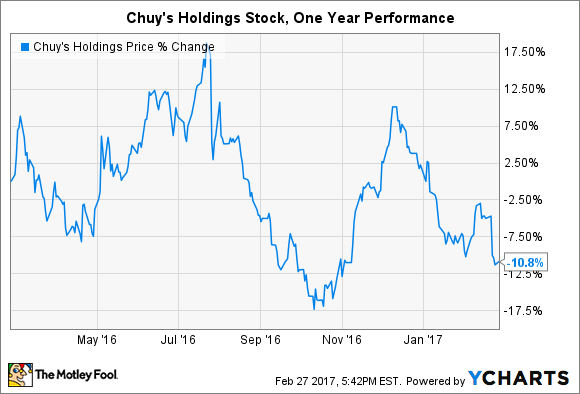 Chuy's has continued to reward investors, growing revenue from just $172 million in all of 2012 to over $287 million in 2015. Heck, the company reported sales of $251 million in just the first nine months of 2016. Affordable menu items and a growing appetite for Tex-Mex (who doesn't enjoy good Mexican food?) have catalyzed 24 consecutive quarters of comparable-restaurant sales growth. So why is the stock on sale? Honestly, there aren't any easily identifiable factors behind the stock's recent slide. Chuy's hasn't announced any change of plans -- which include doubling the number of locations within the next five years -- that would cause investors to run for the exits. The decline is more likely to be chalked up to industrywide headwinds. Smells like an opportunity to me. The company will soon announce full-year 2016 financial results. If the growth strategy remains intact, with annual store growth in the high teens for the next several years at least, then investors should strongly consider picking up some shares. Remember, even if the stock market is at all-time highs, there are always bargains to be had -- you just have to know where to look. Sometimes stocks are on sale for good reasons, such as investors waiting to see if a debt-reduction strategy works or a having a historic glut of uranium supply. And sometimes stocks are on sale for no discernible reason at all, such as a high-growth restaurant stock that has lost nearly 11% of its value despite continued growth. If you rein in your emotions and poke around companies that others are walking away from, then you may just find your next great investment.